1) Queen Helene Mint Julep Masque: a green mask that deeply cleans and refreshes. I use it every time my skin got some pimples or other imperfections: it truly helps to absorb and minimize them. This mask is absolutely a must-have. 2) Loom Serum: pure snail secretion with a high anti-aging effect. It is also good to get rid of acne scars, spots and expression wrinkles. I use it everyday before the moisturizer or even alone, I can't stay without it now. 3) IncaRose Più Volume Plumping RichLips Lipstick in Passion Red: a bright strawberry red lipstick, perfect for this season. The formula contains Hyaluronic Acid and is a good volumising treatment; it gives a nice and lasting plumping effect, which I personally love a lot, together with the shade. These are wonderful products Lilli. It's a good thing that they work well for you. Happy Friday! Li vorrei provare tutti questi prodotti!!! Very nice recommendations Lilli! 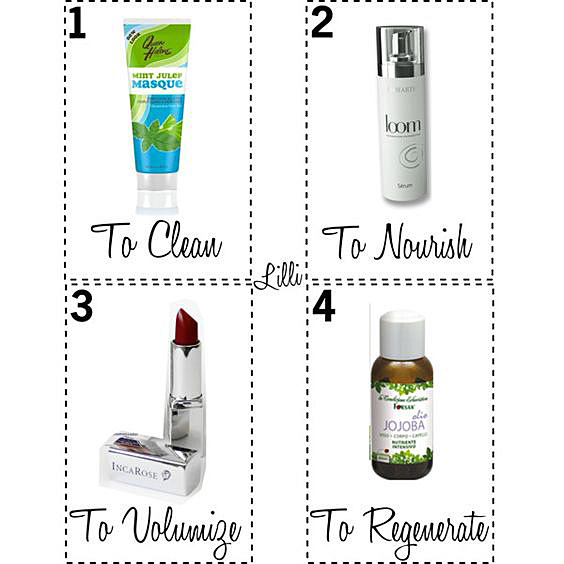 My favourite are the serum and the lipstick; I sure could use those. Happy Friday! Ottimi prodotti, li voglio provare! Nice products Lilli, I would to try some soon, recent I love it cocobut oil for my hair, but I think must to try jojoba oil too, Thanks for the review! I used to also love the Queen Helene Mint Julep Masque but then my skin got sensitive to it and I could use it anymore. I'm using a hot and cold mask from a Korean brand called Caolion that is similar and i love it. Happy weekend Lilli! I have never tried jojoba oil, the oil I've tried is argan which my dry skin truly loves. Definitely something to keep in mind the next time I shop for an oil. Io proverei il rossetto volumizzante Incarose. la maschera la voglio provare, dove l'hai presa? bellissimo anche il rossetto.